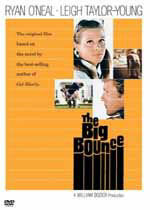 adapted as "The Big Bounce"
Synopsis: Jack Ryan always wanted to play pro ball. But he couldn't hit a curveball, so he turned his attention to less legal pursuits. A tough guy who likes walking the razor's edge, he's just met his match -- and more -- in Nancy. She's a rich man's plaything, seriously into thrills and risk, and together she and Jack are pure heat ready to explode. But when simple housebreaking and burglary give way to the deadly pursuit of a really big score, the stakes suddenly skyrocket. Because violence and double-cross are the name of this game -- and it's going to take every ounce of cunning Jack and Nancy possess to survive ... each other. Additional notes: Original title: Mother, This is Jack Ryan.